by Benjamin, Patricia J., Ph.D. Successful massage therapists excel at blending the art and science of the profession. 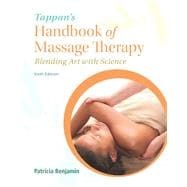 Tappan's Handbook of Massage Therapy: Blending Art and Science is a learning tool for a new generation, but it results from years of experience, wisdom, and research on the part of the author and contributing therapists. This pioneering book in massage therapy provides the foundation, guidance, and the know-how that students need to master the essential task of blending art with science. The new Sixth Edition is an all-inclusive text for massage therapy students that moves beyond technique to encompass expanded foundational learning and professional and personal development, massage techniques, and career and practice development. With its logical format and compelling visuals, students will gain practical knowledge of the techniques and skills they need to become outstanding massage therapists. This title is also available with MyHealthProfessionsLab—an online homework, tutorial, and assessment program designed to work with this text to engage students and improve results. Within its structured environment, students practice what they learn and test their understanding to help them better absorb course material and understand difficult concepts. NOTE: You are purchasing a standalone product; MyHealthProfessionsLab does not come packaged with this content. If you would like to purchase both the physical text and MyHealthProfessionsLab search for ISBN-10: 0134071867 /ISBN-13: 9780134071862. That package includes ISBN-10: 0134062833 /ISBN-13: 9780134062839 and ISBN-10: 0134082699 /ISBN-13: 9780134082691. Patricia J. Benjamin, PhD, LMT is a massage therapist, educator, author, and appreciative massage and bodywork client. She has a deep respect for massage therapy as an art, science, and wellness practice. She has studied its traditions and watches for trends in the massage therapy profession today. Building on her earlier background in sports and fitness, Dr. Benjamin graduated from the Chicago School of Massage Therapy in the mid-1980s. She was drawn to massage as an active, hands-on therapy whose foundations dovetail with her former career in health, physical education, and recreation. After having a full-time massage therapy practice, she gravitated back to education, first as an association education director, and then as a teacher and massage school administrator. Over the years, she has served on various committees involved in the development of ethical standards and national certification for massage therapists, and the accreditation of massage programs. Dr. Benjamin has taught at the high school and college levels, and enjoys developing curriculum materials for the career-oriented courses offered in vocational programs. She holds master’s and advanced study degrees in education with a specialty in curriculum development from Northern Illinois University. A doctorate in recreation and leisure studies from Purdue University has deepened her appreciation of the many facets of wellness and grounded her in a variety of research methods. Frances M. Tappan approached Patricia Benjamin to join her as coauthor of Healing Massage Techniques for its 3rd edition (1998). After Dr. Tappan’s passing in 1999, Dr. Benjamin continued to update and improve Tappan’s Handbook of Healing Massage Techniques (2010), which remains a standard in the field. Dr. Benjamin authored Professional Foundations for Massage Therapists (2009) to address related professional competencies and combined that information with basic massage skills and applications in Pearson’s Massage Therapy: Blending Art with Science (2011). This latest edition of Tappan’s Handbook combines all three of its predecessors for the most comprehensive and up-to-date presentation of the theory and practice of massage therapy available today. Tappan’s Handbook of Massage Therapy: Blending Art and Science, sixth edition, remains true to Frances Tappan’s vision of healing massage as holistic manual therapy that contributes to the well-being of humanity in so many ways. In her leisure time, Dr. Benjamin enjoys reading historical fiction and nonfiction, gardening, tai chi and qi gong, and table tennis. Her outdoor pursuits include hiking, canoeing, and birding. She currently resides in Chicago, Illinois.